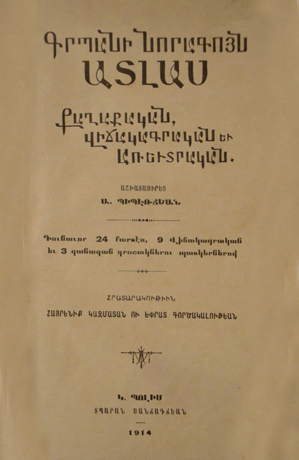 The Armenians were one of the firsts to make use of GutenbergвЂ™s invention. 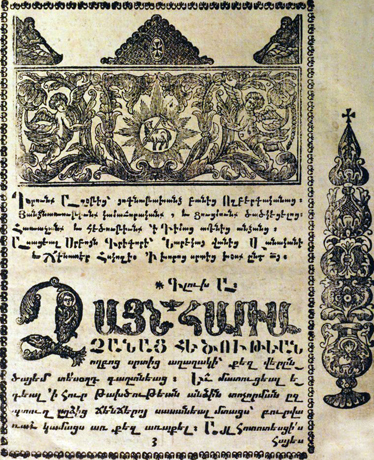 Since 1512 they have established printing houses and published books in different corners of the world, where there were Armenian colonies. 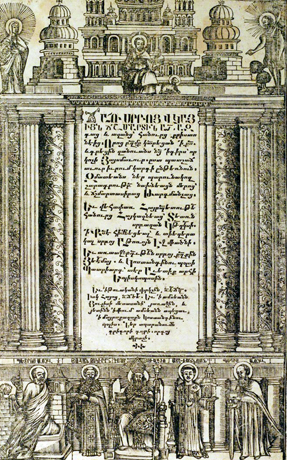 The Ottoman Empire was not an exception and in 1567 the first Armenian book was published in its capital, Constantinople. 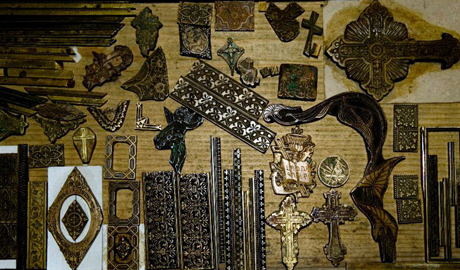 In time Constantinople became one of the main centers of the Armenian book printing and preserved its role till the beginning of the 20th century. 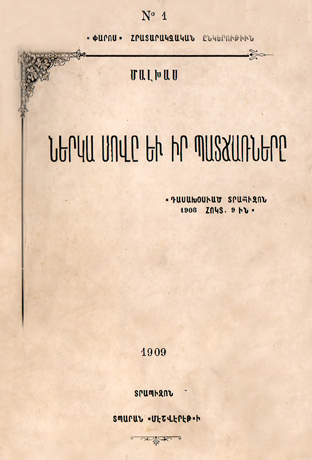 After a short typographic activity of Abgar Tokatetsi (1568 - 1569) and Yeremia Kyomurjian (1677-1678) in Constantinople, in the 17th century Sargis EvdokatsiвЂ™s, Grigor MarzvantsiвЂ™s and Astvatsatur KonstandnupolsetsiвЂ™s publishing houses were established, which ran constantly and had fruitful typographic activity for a long time. 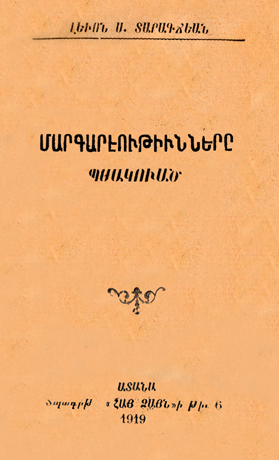 Among the famous Western Armenian publishers were also Pogos Arapian, Sargis Dpir, Chnchin Hovhannes and others. 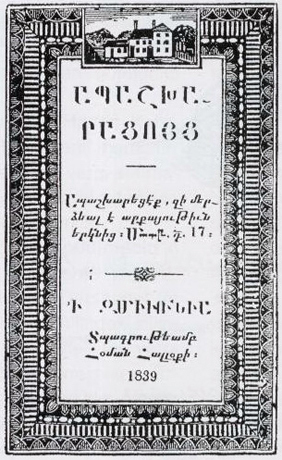 Till 1800 almost 350 Armenian books had been published only in Constantinople. 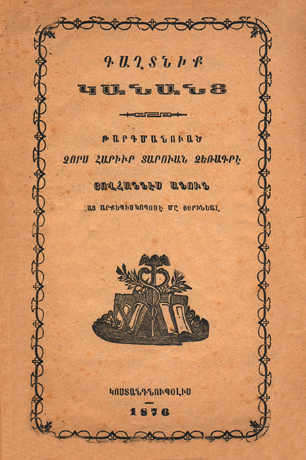 Next to the early religious and moral publications, historical, fiction, educational, scientific and other literature was published in Old and Modern Armenian, including translated and authorвЂ™s literature. 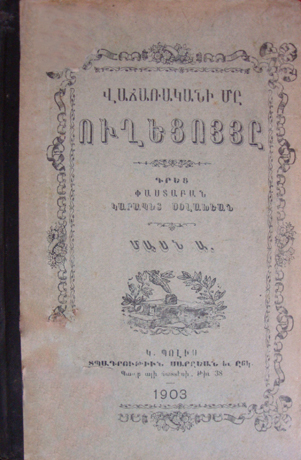 The Armenian publishing houses were established in Smyrna, Armash, Van, Mush, Bursa, Adana, Adrianapole, Adabazar, Konya, Nicomedia, Samsun, Karin, Erznka, Evdokia, Kharberd, Amasia, Marzvan, Ayntap and elsewhere. 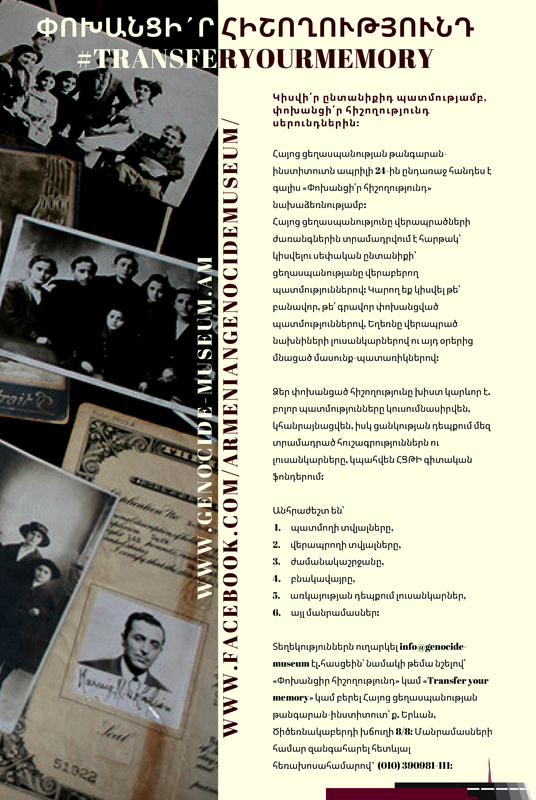 During the Armenian Genocide the printing houses that were functioning in Western Armenia and in the cities of the Ottoman Empire, mostly populated with Armenians, ceased their existence. 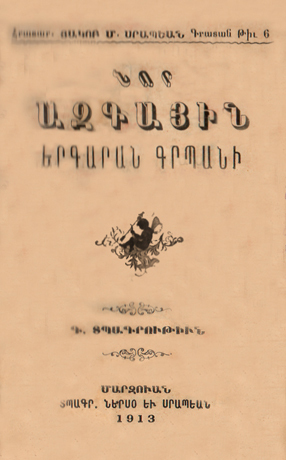 During these years hundreds of printing houses, libraries and repositories of ancient manuscripts were destroyed, tens of thousands of Armenian books were burnt. 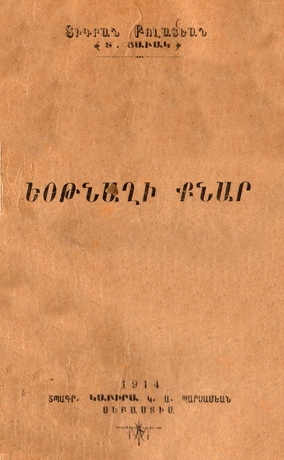 From History of Armenian Printing Houses of Constantinople: block letters and template-clichГ©s. "St. JohnвЂ™s Book of Revelation and Interpretation", Constantinople, 1700. "Small and Nice Song-book, Songs Sung by Wise Poets", Constantinople, 1700. 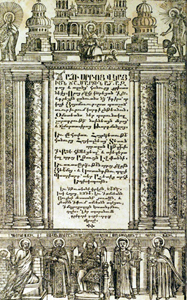 "The Bible", Constantinople, the Printing House of Petros Latinatsi, 1705. "Yasmavurk", Constantinople, the Printing House of Marzvantsi, 1706. 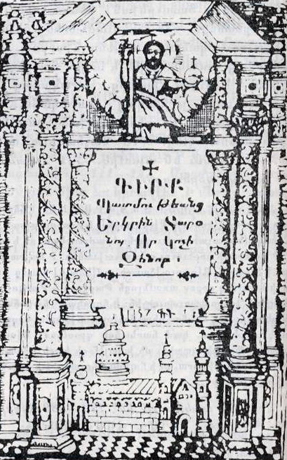 Agatangeghos, "History of Armenians", Constantinople, the Printing House of Grigor Marzvantsi, 1709. 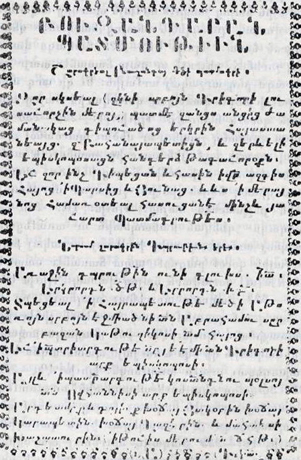 Zenob Glak, "Book about the History of Taron", Constantinople, the Printing House of Grigor Marzvantsi, 1719. 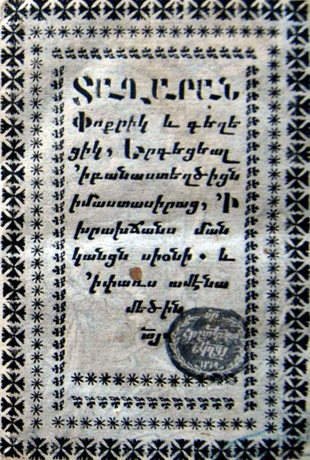 Grigor Narekatsi, "Prayer Book", Constantinople, the Printing House of Hovhannes and Poghos, 1782. 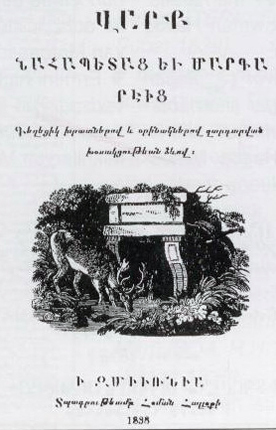 "Book of Life for Children: Religious Songs, Precepts and Real Histories", Smyrna, Homan Hallok Printing House, 1838. 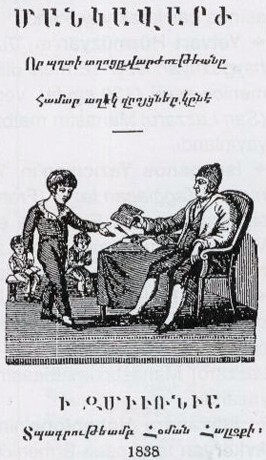 "Pedagogue that Gives Useful Talks to Educate Boys", Smyrna, Homan Hallok Printing House1839. 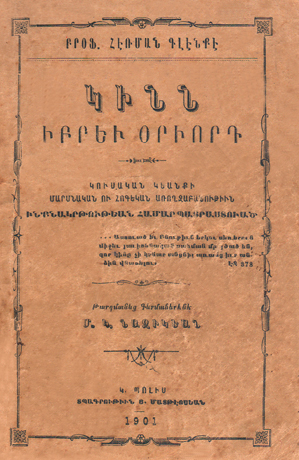 "The Life of Patriarchs and Prophets (Conversations with Useful Precepts and Examples)", Smyrna, Homan Hallok Printing House, 1839. "Book of Confession", Smyrna, Homan Hallok Printing House, 1839. 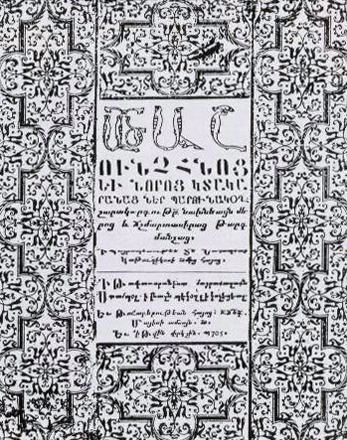 "Song-book of the Armenian St. Church", Hortagyugh, the Printing House of Poghos ArapianвЂ™s sons. "Mother Taking Care of Her Child", Translated from the Original English text, Smyrna, Kulielmous KriftвЂ™s Printing House, 1840. 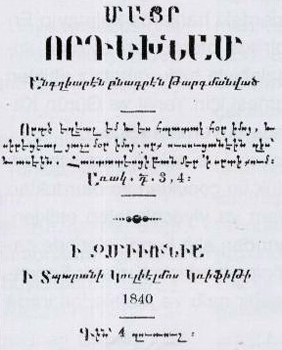 "ArmeniansвЂ™ National Constitution", Constantinople, 1863. 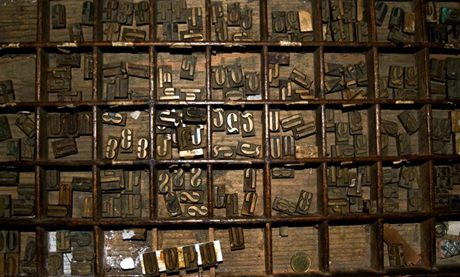 Carlo Goldoni, "The Virtue of Bamelatsi", Comedy, Smyrna, Teteian Printing House, 1866. 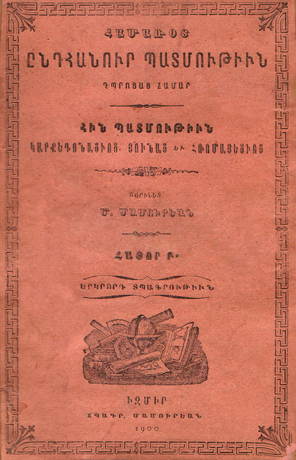 "Grammar Textbook for Elementary Schools", Constantinople, Hovhannes TerotentsвЂ™ Printing House, 1870. 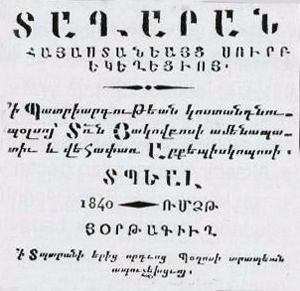 "WomenвЂ™s Secret, Translated from a 400-year Old Manuscript, by Armenian Archbishop Hovhannes", Constantinople, 1876. 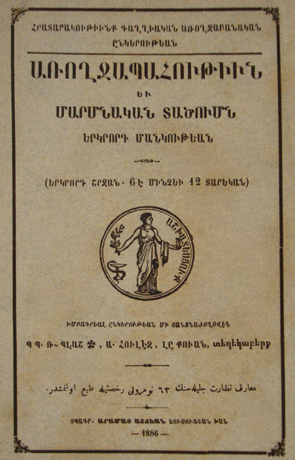 "Health and Physical Care for the Youth", Aram Ashjian's Printing House, 1886. 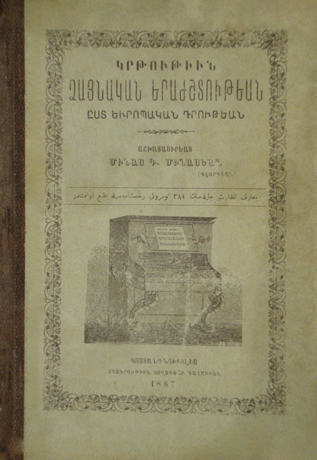 Minas G. Minasian, "Musical Education According to the European Norms", Constantinople, Hovsep Galafian's Printing House, 1887. 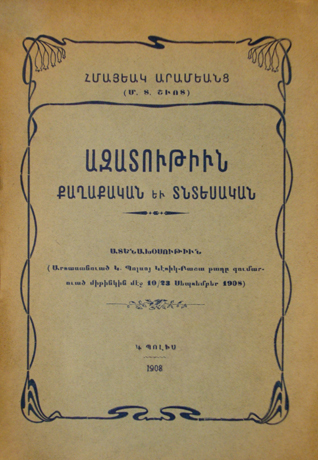 Priest Hovhannes Mavian, "Principal of Moral Education", Nicomedia, Armash of Van Printing House, 1889. 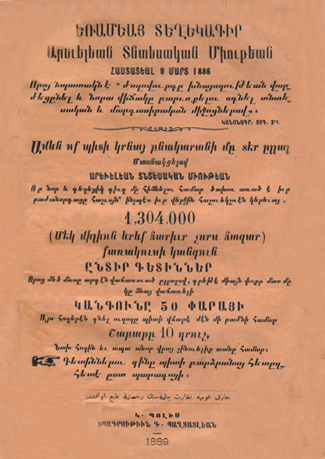 "Triennial Reference Book of the Eastern Economic Union, Established on March 9, 1886", Constantinople, G. Paghtatlian Printing House, 1889. 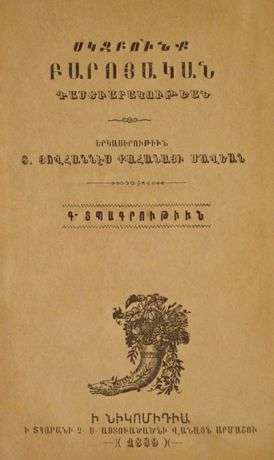 Levon Mkrtchian, "Marriage Problems; Man - Woman", Constantinople, 1894. 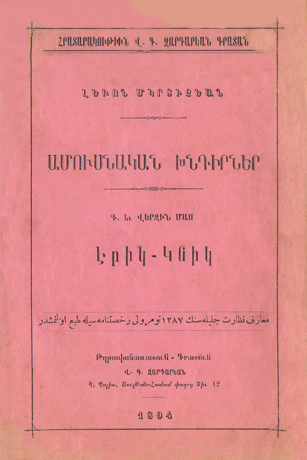 M. Mamurian, "General History for Schools in Brief", II volume. 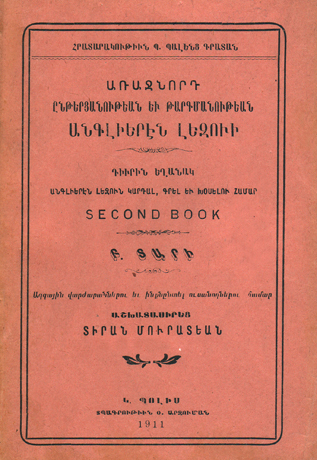 Second edition, Smyrna, Mamurian Printing House, 1899. Herman Glenke, "Female as a Virgin, Hygiene of Physical and Spiritual Health of Virgin Life", translation from German by M.K. Nazikian, Y. Mateosian Printing House, Constantinople, 1901. 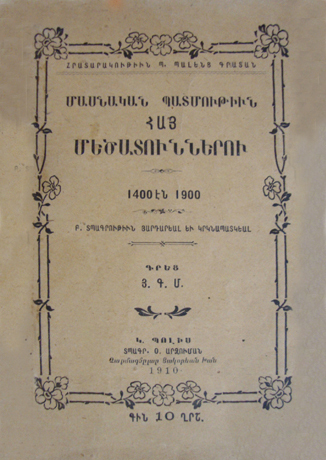 K. S. Tukhmanian, "Commercial and Economic World", Smyrna, Mamurian Printing House, 1902. 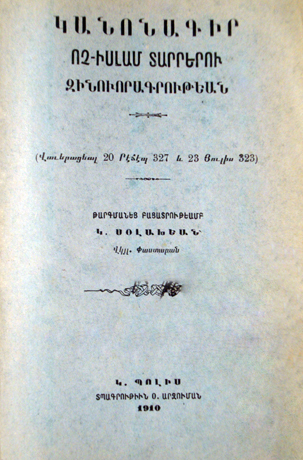 Karapet Solakhian, "Reference Book of a Merchant", Part A, Constantinople, Sarian and Friends Printing House, 1903. 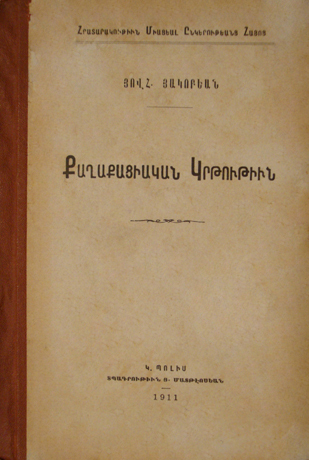 Hmayak Aramiants, "Political and Economic Freedom", Constantinople, 1908. 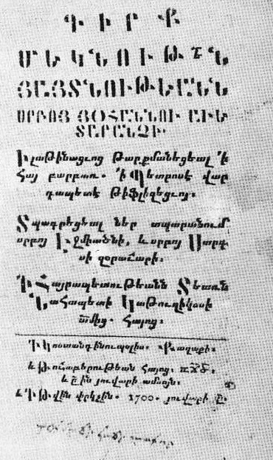 Malkhas, "Current Starvation and Its Causes", Trebizond, Meshveret Printing House, 1909. 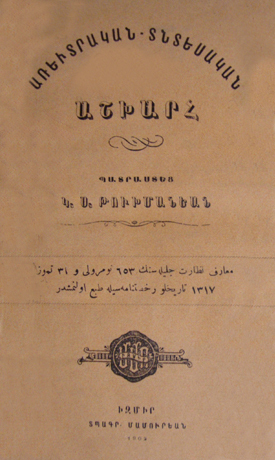 Y.G.M., "Private History of the Armenian Wealthy", Constantinople, O. Arzuman Printing House, 1910. 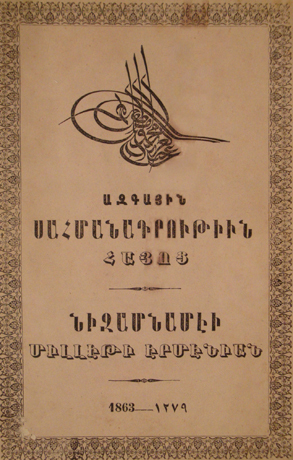 "Code of Rules for Non-Muslim ElementsвЂ™ Enlistment", translation by K. Solakhian, Constantinople, O. Arzuman Printing House, 1910. 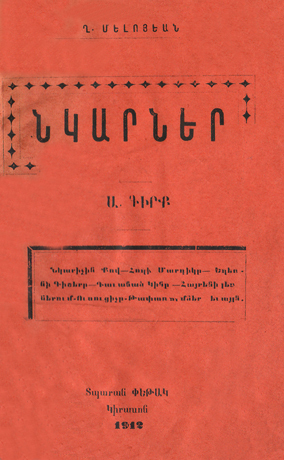 R. Asasian, "Little Hero: From the Turkish Life", Evdokia, 1911. Sarah Nelson Carter, "For the Sake of Love and Mercy: Love Animals and Adore Them", Constantinople, O. Arzuman Printing House, 1911. 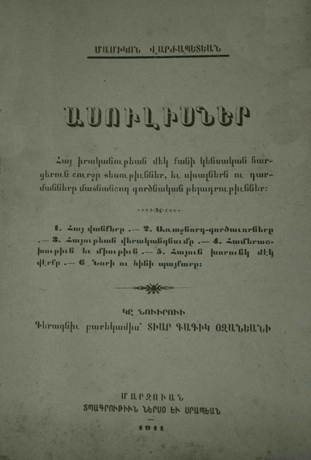 Hovhannes Hakobian, "Civic Education", Constantinople, Y. Mateosian Printing House, Constantinople, 1911. 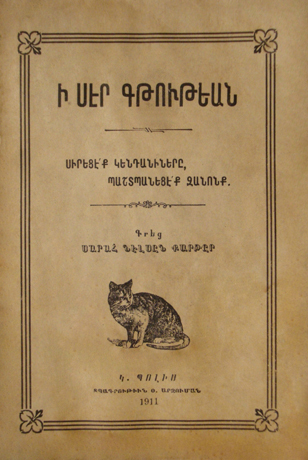 Tiran Muradian, "Guide for Reading and Translation from English", year B, Constantinople, 1911. 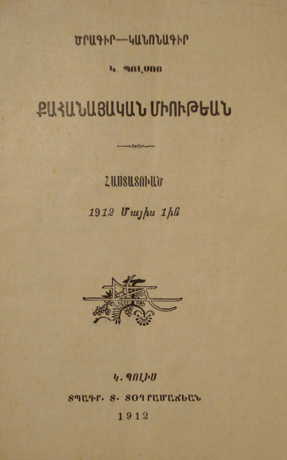 G. Gojaian, "Armenian Sighs: Patriotic and Religious poems", Marzvan, Nerso and Srapian Printing House, 1911. 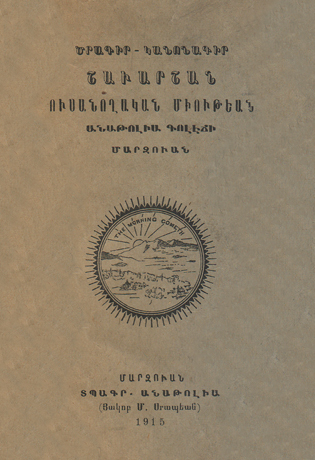 Mamikon Varjapetian, "Conversations: Review of Some Significant Issues of the Armenian Reality, Practical Direction Pointing out to the Mistakes and Solutions", Marzvan, Nerso and Srapian Printing House, 1911. Gh. 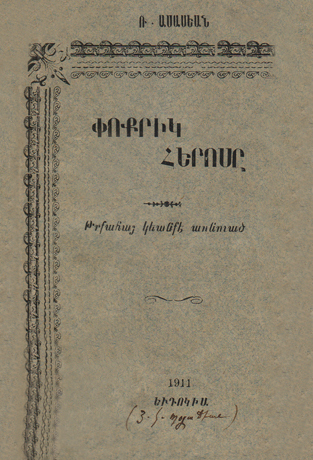 Meloian, "Pictures", book A, Kirason, Petak Printing House, 1912. 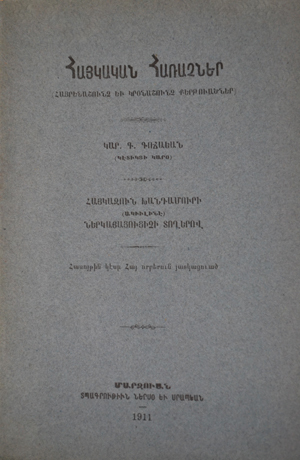 G. Vardapetian, "Topographic Geography of National Schools of Amasya", Prepared for the First Two 2 Months of III form, for 1911-1912, Amasya, Pokr Hayk Printing House, 1912. 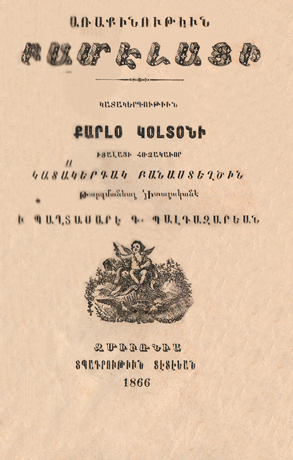 A. Totel, "Mousses or Darwin", translated by Gurgen N. Papazian, Kirason, Petak Printing House, 1912. 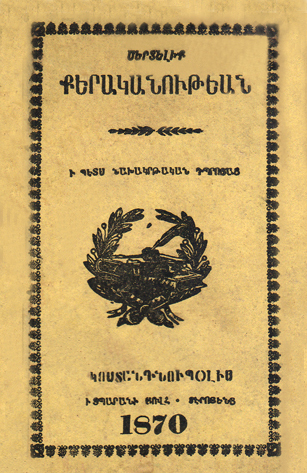 "Pocket Book of New Patriotic Songs", Marzvan, Nerso and Srapian Printing House, 1913. 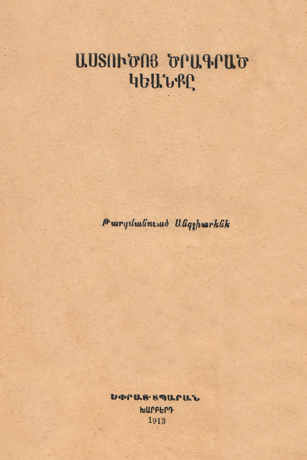 "Life Planned by God", translation from English, Kharberd, Eprat Printing House, 1913. S. Piperjian, "New Political, Statistical and Commercial Pocket Atlas", Constantinople, Sanjagjian Printing House, 1914. 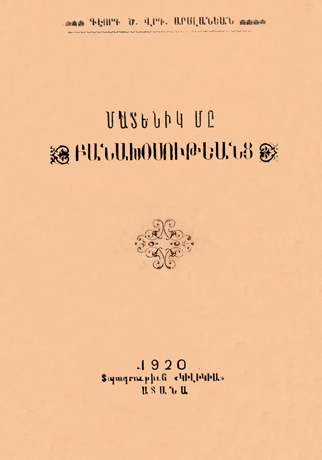 Tigran Bolatian, "7 String Lyre", Sebastia, Kabira K. A. Parsamian Printing House, 1914. 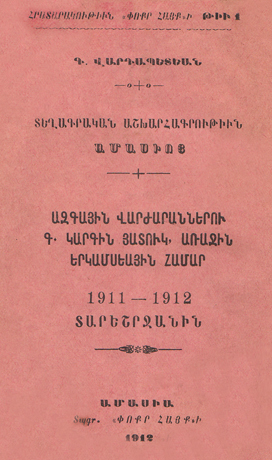 "Program and Code of Rules of Shavarshian Student Union at Anatolia College", Marzvan, Anatolia Printing House (Y. M. Srapian), 1915. 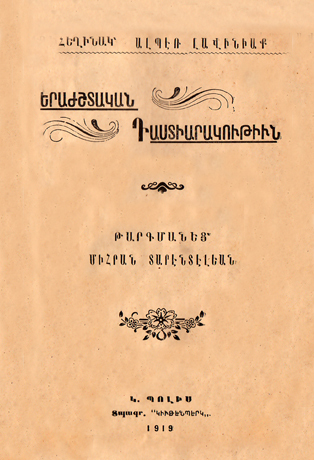 Alper Lavinia, "Musical Education", translation by Mihran Tarentelian, Constantinople, 1919. 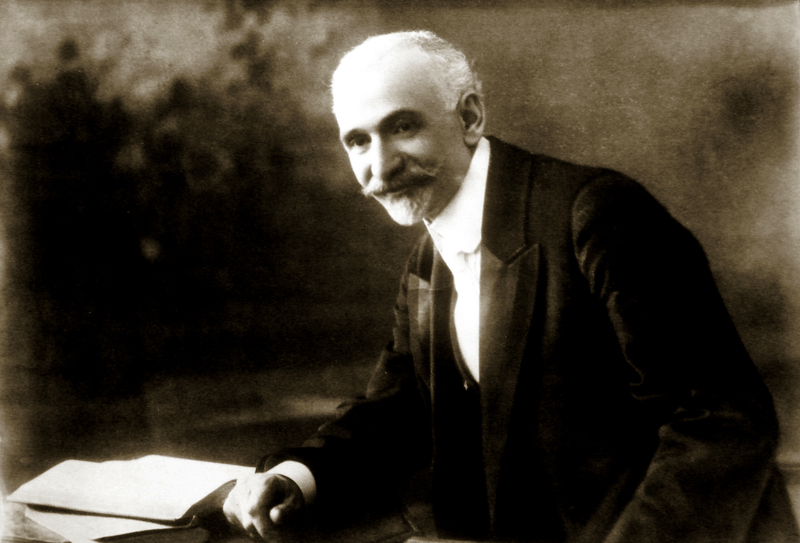 Levon S. Taragjian, "Fulfilled Prophecy", Adana, Hay Dzayn Printing House, 1919. 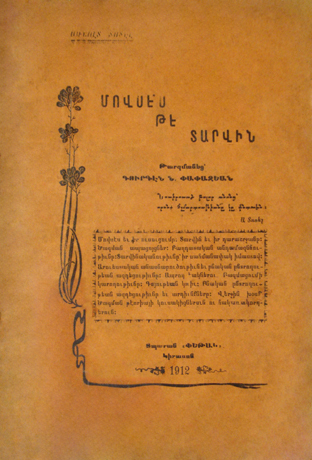 Manuscript of Reports, "Gevorg Arslanian", Adana, Cilicia Printing House, 1920.